Happy Sunday! I come from a family of coffee LOVERS! I am not addicted to coffee but do enjoy sipping on iced coffee drinks from places such as Dunkin Donuts occasionally. Like many of you know however, those can start to add up in price. These recipes are cheap to make at home and taste JUST as good. Count me in! Fill 3/4 of the cup you are using with Ice. Then fill with a mixture of cream or milk or both! The amount you use depends on how strong you want your drink. Then just pour in your iced coffee, stir, and enjoy! Scoop vanilla ice cream into a cup of your choice and then pour freshly brewed hot coffee over top. The result is a creamy coffee drink with a vanilla sweetness! In a small bowl, combine your chocolate syrup and iced coffee. The more syrup the sweeter it will be, the more coffee the stronger it will be so adjust your ratios according to preference. Then pour the mixture in an ice cube tray and freeze over night or for at least 4 hours. Place your coffee cubes in a cup of choice and then pour milk over top. Give it a few good stirs before drinking. The result is an iced java drink that is for those with more of a sweet tooth. This drink only gets better as you drink it and the ice melts! Well there you have it! 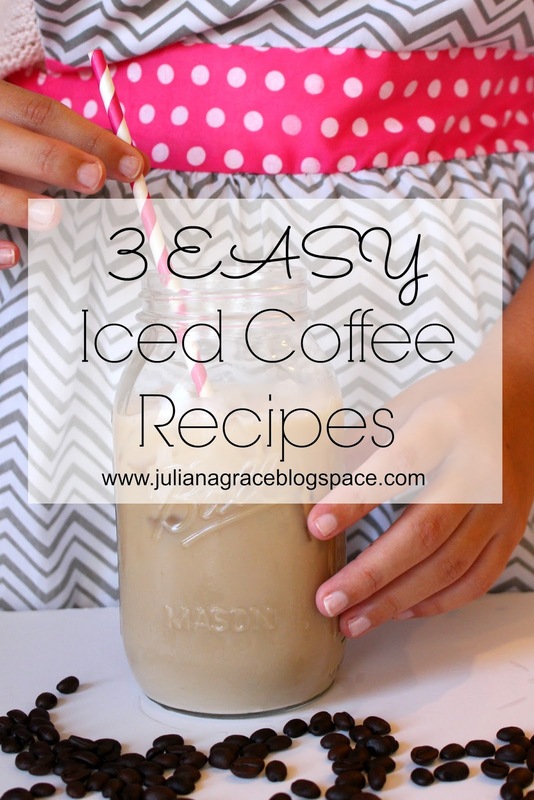 3 EASY Iced Coffee Recipe for you to make at home for cheaper than you could purchase them in restaurants. Stay tuned this week for more coffee goodness!! Talk to you soon!